Kefir is generally used to describe the milk kefir drink made using a dairy source but there is another kefir referred to as water kefir or Tibicos or Japanese water crystals. It’s a refreshing drink to enjoy all year round that’s full of probiotics. Water kefir is a probiotic drink made using sweetened water and the translucent water kefir grains (culture or SCOBY). It produces a lightly effervescent drink with huge potential for flavouring and colouring according to what is in season and what you like. Water Kefir is fermented using a specific culture called a SCOBY which is a Symbiotic Colony or Bacteria and Yeasts that thrives on the sugar and water mix. The SCOBY may also be referred to a water kefir grains or crystals but they have nothing to do with grains in a gluten sense. It’s just a reference to the way they kind of look…. The colony is held together by a polysaccharide matrix called kefiran and as they consume the sugars, they produce lactic acid, a small amount of alcohol and carbon dioxide. This is where the plain flavour comes from and why it gets sourer the longer it is fermented for. As water kefir provides a diverse range of microbes to the gut, it has the effect of rebalancing the microbial mix and crowding out the available space for pathogens to dominate. This in turn improves digestion, the immune function, reduces sugar cravings and rehydrates. Another advantage of water kefir is that is dairy free so when dairy is an issue there is another probiotic solution here. I also like to think that water kefir provides an alternative to wean both children and adults off conventional soft drinks through consuming a drink that has a wide variety of flavours, is easily coloured but that is full of beneficial microbes for the gut. Water kefir is simply made by adding the sweetened water to the water kefir grains, capping and leaving to ferment for 1-3 days depending on climate and seasons. I use about 4 tablespoons of grains in a litre of water with ¼ of a cup of sugar. I also add half a cleaned egg shell to provide extra nutrition for the grains and a couple of slices of ginger for flavour, digestion and personal preference. There are lots of different additives that you may find if you are doing research, such as adding some molasses, a slice of lemon, un-sulphured figs and bi-carb soda. Most of these are different ways to provide extra minerals for the culture. I’ve kept it simple and it consistently works in my home. Once the water kefir has fermented, strain off the grains, ginger and egg shell……then start your next batch with the grains, fresh ginger and a new egg shell! As you can see it can be a fast process in warm weather. I tend to use a cane sugar, so either an organic raw or a rapadura sugar according to your preference for the flavour and priority for feeding the Scoby or grains. The grains like the additional minerals in the rapadura sugar which they feed on in the fermentation process. I have no issue with adding the sugar knowing that it is used up as food for the SCOBY rather than it all being in the final brew. As to the water, not all waters are the same! A filtered water or a non-chlorinated water are appropriate so they are microbially friendly and not at war with the culture doing the fermenting! I always use organic sugar and filtered water but I swap between using raw and rapadura sugar according to who is my priority. My daughter prefers the flavour when it’s made using raw sugar but the grains prefer the rapadura! Happy grains will mean that they continue to multiply with each batch so it is wise to start small. Allow your body to get used to the ferment and then gradually adjust your quantities as the grains grow and multiply and your body accepts greater volumes. Where do you get Water Kefir grains from? Water kefir grains can be purchased from Mattewsons and Kitsa’s Kitchen or even on ebay but there are also global culture share groups that you can check out. I also supply them in the classes teach with instructions on the method. How long should I ferment my Water Kefir? To work out how long to ferment, you monitor the bubbly activity and the taste. I like to catch it when the bubbles are starting to slow down and the brew is less sweet but not tart. It’s a learning game with a feedback loop so learn to ferment them to taste, that is the taste you like. I say this because when you start you have an amount of grains, sugar and water but with each batch and over time they evolve. The grains multiply and the seasons change. Each has an impact on the length of time to ferment. So, observe and interact…..adjust accordingly. If your grains have multiplied too fast then divide to another batch or put them to sleep. If you end up with more grains in your batch it will just ferment faster and use up the sugar quicker. It’s logical. So either add extra sweetened water, divide the batch or know that it will be ready to strain and consume sooner. As the seasons change so will the time to ferment. 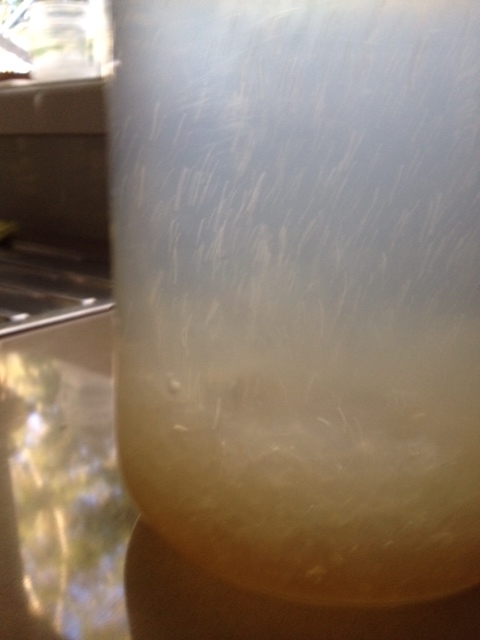 Water kefir and other lacto-ferments respond to changes in temperature. If it’s getting warmer, they will ferment faster and conversely, if the weather is cooling, they will ferment slower. But….. Water kefir grains will thrive better in cooler weather so if the weather is warming up and the grains are not doing so well, with all other variables stable, you may want to transfer them to a cooler place to ferment for the season. But don’t put them in the fridge as this will make them dormant. Our weather is warming up so my water kefir is fermenting in 24-36 hours per batch. I’m monitoring how the grains are going as they are not as big as they were over the cooler months. In winter in my home it can take from 48-72 hours with no concerns for the drop in temperature. I ferment in 1.5 litre batches so that I get two, 750ml bottles to second ferment. There is just one caution that I have to tell you. Water kefir can get explosive if left unattended. Once the ferment is strained and stored in a capped bottle it will continue to ferment and build up gases. These can be burped once or twice a day while second fermenting or every one to two days when in the fridge. This is being conservative but it’s not a nice experience to clean up and there are stories of people being hurt. I thoroughly enjoy this beverage but I treat the brew with respect and due attention. I still have marks on the ceiling and walls where it has escaped from the bottle quicker than I could contain the gradual release of the gas. I burp the bottle by a process of release and cap, release and cap till the built up gas has dissipated enough to pour into a glass or cup. I’ve never had an actual explosion of a bottle. So, you have two kefirs to choose between to drink your beneficial bacteria: the dairy milk kefir and the water kefir. They are cheap to make, taste great and have loads of potential. Water kefir can be second fermented, added to slushies, smoothies or frozen as ice blocks. We are now using the water kefir in our dehydrated fruit straps to create probiotic snacks. This week its mango as they are in season!